Marty worries about a great unraveling. President Obama is getting heat over his often repeated claim that, under his healthcare reform, "If you like your plan, you can keep it." 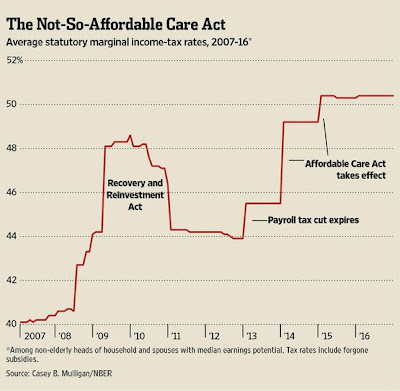 It is clear now that for millions of Americans, particularly those who participated in the individual insurance market, that is simply not true. You can argue that the plan they will get under the Affordable Care Act is better, but it seems undeniable that the President's sales pitch was factually incorrect. 1. The White House staff did not know the statement was false. That is, they did not understand the law the administration was promoting. 2. The White House staff knew the statement was false, but they decided to keep this fact from the President. That is, they let the President unwittingly lie to the American people. 3. The White House staff knew the statement was false and told the President so, but the President decided to keep saying it anyway. That is, the President consciously decided to lie to the American people. These are the only three possibilities I can envision. None of them reflects particularly well on what has been going on in the White House. Here is a question for students who are learning about compounding. What is wrong with the following passage from The Economist magazine? Answer: The second number is inconsistent with the first. Note that .98^35=.49, so we get only a 51 percent cumulative loss. In fact, the price level from 1946 to 1981 rose by a factor of about 5, so holding currency with a zero nominal return led to a real loss of only about 80 percent. Arnold Kling diagnoses what went wrong with the new healthcare exchange website. We exploit a policy discontinuity at U.S. state borders to identify the effects of unemployment insurance policies on unemployment. Our estimates imply that most of the persistent increase in unemployment during the Great Recession can be accounted for by the unprecedented extensions of unemployment benefit eligibility. In contrast to the existing recent literature that mainly focused on estimating the effects of benefit duration on job search and acceptance strategies of the unemployed -- the micro effect -- we focus on measuring the general equilibrium macro effect that operates primarily through the response of job creation to unemployment benefit extensions. 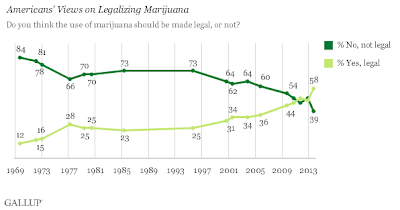 We find that it is the latter effect that is very important quantitatively. Says my Harvard colleague Raj Chetty. An interesting article, which raises the following questions in my mind: Is the younger generation of economists like Raj skipping some of the big questions of economics because some smaller questions are easier to answer? 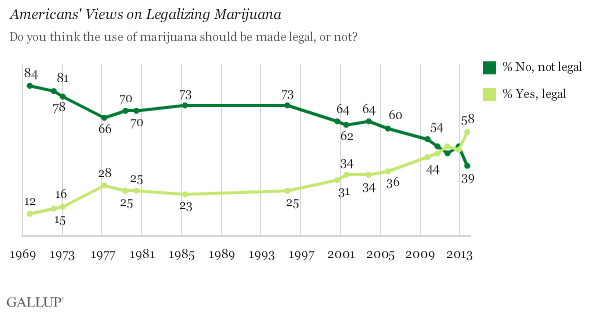 If so, is that optimal from the standpoint of society as a whole? The seventh edition of my favorite textbook will be coming out in January. One of the new features available to users of the electronic version of the book is a group of video introductions to many chapters, featuring the book's all-too-geeky author. You can see the first one below. 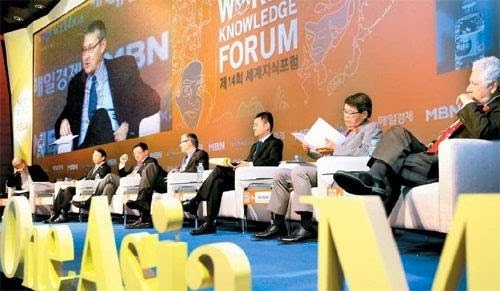 I have spent the past few days at the World Knowledge Forum in Seoul, Korea. While there, I gave a lecture on some of the challenges facing fiscal policy, joined Tyler Cowen in a public discussion of economic inequality, and participated in a panel on the global economic outlook (from which the photo below is taken). Congratulations to Eugene Fama, Lars Hansen, and Robert Shiller. A very well-deserved prize. All three have long been among the most highly cited economists. Last night, I saw Bryan Cranston in All the Way, the new play about Lyndon Johnson and the passage of the Civil Rights Act. It is a powerful play, with terrific acting. Cranston is as compelling as LBJ as he was as Walter White. On weights and coding errors: odd coincidence or dress rehearsal? Angus Deaton recounts an unpleasant episode in his career. Followers of the Reinhart-Rogoff controversy, take note. President Obama has made a great decision in choosing Janet Yellen to chair the Federal Reserve. The image above, by the way, is one of the illustrations in the next edition of my favorite textbook (which is now in production). When supervising the artist, I had to guess who the next Fed chair would be. As you can see, I guessed right. Addendum: Someone asks whether the helicopter in the picture is a reference to the current chairman's somewhat pejorative nickname "Helicopter Ben." The answer is no, not at all. 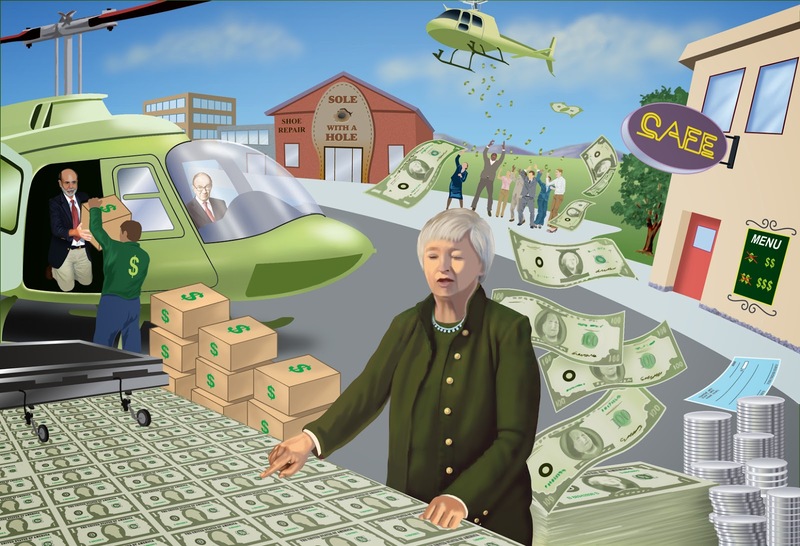 I used a helicopter in this interior illustration since the third edition, which predates Bernanke's becoming Fed chair. Ben has used the helicopter metaphor for monetary policy, but the metaphor is not original to him (or to me). I would guess it started with Milton Friedman, but I am not entirely sure. I am a friend and fan of the University of Chicago's John List. (I had the pleasure of working with John about a decade ago at the Council of Economic Advisers.) So at the very top of my pile of books to read is John's new one, with Uri Gneezy, called The Why Axis. The WSJ and FT continue to write about the risk of default, quoting the Treasury, Boehner and others.There really is no need for a default on the debt even if the debt ceiling is not raised later this month. The US government collects enough in taxes each month to finance the interest on the debt, etc. The government may not be able to separate all accounts into "pay" and "no pay" groups but it can certainly identify the interest payments. An inability to borrow would have serious economic consequences if it lasted for any sustained period but it would not have to threaten our credit standing. Update: And a follow-up from Ken. The BEA website is no longer operative.